For both BIF and SAIF, higher interest revenue on U.S. Treasury obligations stemmed from higher overnight and short-term Treasury yields as well as higher inflation compensation on Treasury Inflation Protected Securities. However, the higher interest revenue was more than offset by an increase in unrealized losses that resulted from a rise in Treasury market yields on short- to intermediate-maturity AFS securities during 2005. Corporate Operating Budget expenses totaled $990 million in 2005, including $979 million in ongoing operations and $11 million for receivership funding. This represented approximately 95 percent of the approved budget for ongoing operations and 15 percent of the approved budget for receivership funding. In December 2005, the Board of Directors approved a 2006 Corporate Operating Budget of approximately $1.05 billion, including $975 million for ongoing operations. The level of approved Corporate Operating Budget for 2006 is more than 5 percent lower than the Corporate Operating Budget for 2005 due to savings achieved through continued staffing reductions and the realization of other efficiencies. The Corporate Operating Budget includes funding for a number of major new initiatives, including increased funding for consumer protection activities; continued implementation of the Corporate Employee Program; several new learning initiatives consistent with the Corporation's commitment to an environment of continuous employee growth and development; and several projects to explore increased automation of the bank examination process. The FDIC has a disciplined process for reviewing proposed new investment projects and managing the implementation of approved projects. Most of the projects in the current investment portfolio are major IT system initiatives. Proposed IT projects are carefully reviewed to ensure that they are consistent with the Corporation's enterprise architecture and include an appropriate return on investment for the insurance funds. The process also enables the FDIC to be aware of risks to the major capital investment projects and facilitates appropriate, timely intervention to address these risks throughout the development process. An investment portfolio performance review of the major capital investments is provided to the FDIC's Board of Directors quarterly. During 2005, the Corporation completed and implemented three projects in its investment portfolio. Spending for investment projects in 2005 totaled approximately $62 million, but is expected to drop significantly in 2006. The Board of Directors did not approve any new investment projects in 2005. 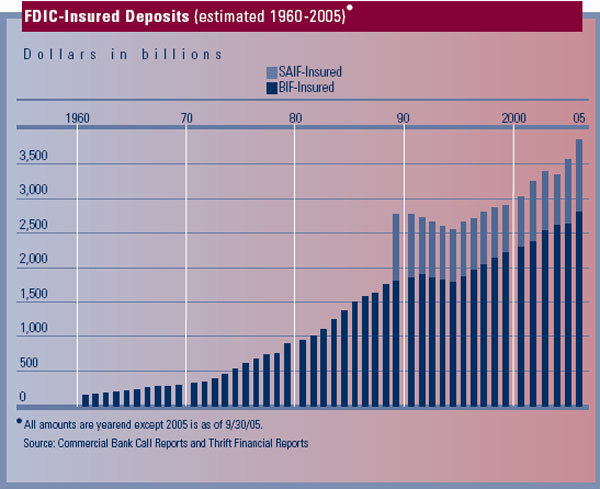 The following tables show the number and percentage of institutions insured by the Bank Insurance Fund (BIF) and the Savings Association Insurance Fund (SAIF), according to risk classifications effective for the first semiannual assessment period of 2005. Each institution is categorized based on its capital group (1, 2, or 3) and supervisory subgroup (A, B, or C), which is generally determined by on-site examinations. Assessment rates are basis points, cents per $100 of assessable deposits, per year. 1 BIF data exclude SAIF-member "Oakar" institutions that hold BIF-insured deposits. 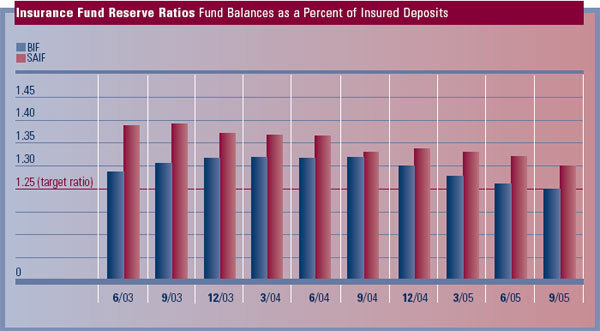 The assessment rates reflect the rates for BIF-assessable deposits, which remained the same throughout 2005. 2 SAIF data exclude BIF-member "Oakar" institutions that hold SAIF-insured deposits. The assessment rates reflect the rates for SAIF-assessable deposits, which remained the same throughout 2005.